Every child in southern India at some point in their childhood is dragged, grudgingly or otherwise, to either a Bharatnatyam dance class or a Carnatic music class. The ones with talent and inclination go the whole hog, while the rest bail out as soon as they can. R.V. Raghavendra was one of the latter. Though he enjoyed Carnatic music and attempted to master the ragas as a child, increasing academic pressure meant that he had to give up music. “I enjoyed listening to Carnatic music, but found that my knowledge of the grammar of Carnatic music was inadequate," he says. So, in 1995, he started Ananya—an NGO that aims to encourage children to understand and appreciate Carnatic music. A large chunk of Ananya’s efforts are directed towards organising a platform for children to perform on stage for the first time. 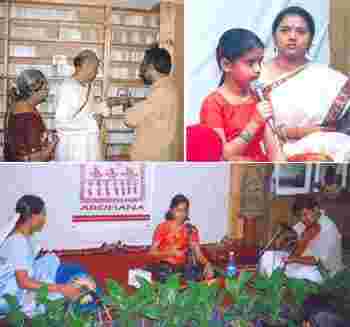 In addition to organising shows and encouraging an understanding of Carnatic music, Ananya also runs a music library, Ananya Sangraha, which houses records of live concerts (some more than 70 years old) along with books on Carnatic music. In early 2007, Ananya with support from the India Foundation for the Arts launched a radio programme called Hadu Hakki (‘sing bird’ in Kannada). The 19 episodes of the programme were recorded in Kannada and aired on All India Radio stations across Karnataka. The show, which was hosted by children, included information on Carnatic music and had interactive sessions. “The idea was to tell children that basis for film songs and light music comes from classical music too. To our surprise, letters from children poured in from across the state. Some children even sent us their poems, asking us to tell them which raga would suit these poems," says Raghavendra. As a finale to the successful episodes, Ananya will release 10 audio CDs with recordings of all the 19 episodes. These will be released as a part of the Hadu Hakki Habba, a festival that invites kids between 10 and 16 to participate in fun-filled activities related to Carnatic music. The festival includes essay writing, collage making, quizzes, games, presentations by senior musicians, all based on the theme of Carnatic music.